Dolce tile offers extensive variety of tiles. We distinguished ourselves with our unique products in the tile market. Our goal is giving the best service to our customers and fulfilling their needs. Our product lines are porcelain tile, ceramic tile, glass tile, mosaic tile and natural stone tiles such as marble tile, travertine tile, granite tile, slate, limestone. 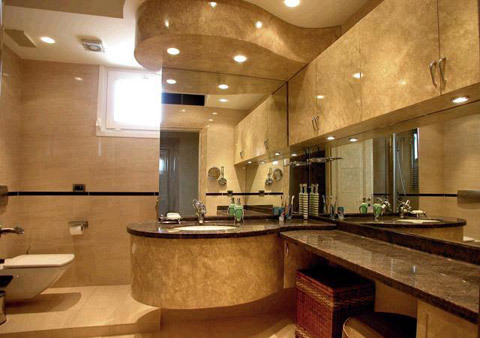 Natural Stone is being created as a result of millions of years of different geological changes. Wide variety of vibrant colors and characteristics developed by nature over millions of years. The Natural Stones have been categorized into marble, granite, travertine, limestone, slate, Onyx, quartzite, sandstone, etc. Marble is perfect to use any room in your home. Marble is a metamorphic stone formed when limestone is compressed for extended periods of time. It is typically found in the roots of mountains, and is composed of up to 95% calcite. •	Polished marble tile: ¬ An elegant, high shine for a more stately and formal appearance. •	Honed marble tile: ¬ An understated matte finish that softens the stone’s appearance, creating a casual atmosphere in any room. •	Brushed marble tile: ¬ An antique finish that gives your room a reserved, old-world ambiance. •	Tumbled ¬ marble tile: A finish that offers you antiqued, ageless style in neutral colors. Granite is the hardest of structural stones. Hardness and density make granite an ideal choice for flooring, counter tops, vanities as well as exterior applications. Granite is also the most “maintenance-free” of all stones. Naturally anti-bacterial and easy to clean. Granite is the ideal material for kitchens and bathrooms. •	Polished ¬granite because it is very dense, granite can be polished to a high shine, perfect for kitchen and bathroom surfaces. •	Flamed granite¬ sometimes a bright luster isn’t the best solution, so we also offer a flamed finish that exposes the surface of the stone and shows off the minerals that give granite its unique texture. Travertine tile is one of the most frequently used stones in modern architecture, and is commonly seen as facade material, wall cladding, and flooring. The largest building in the world constructed largely of travertine is the Colosseum in Rome. Another notable building using travertine extensively is the Getty Center in Los Angeles, California. The travertine used in the construction was imported from Tivoli, Italy, near Rome. The travertien tile is most widely used in Italy, Greece and Turkey. Travertine is one of several natural stones that are used for paving patios and garden paths. The travertine stone is characterized by pitted holes and troughs in its surface. Some installers use a grout to fill these holes, whereas others leave them open — travertine tile can even be purchased "filled" or "unfilled." It can be effectively polished to a smooth, shiny finish and comes in a variety of colors from grey to coral-red. Travertine is most commonly available in tile sizes for floor installations. Polished: Available in both Travertine and Marble. Polish on the marble is more lasting due to the composition of the stone. Honed and Filled: Most common finish for travertine tile. Surface of the Travertine tile is given a matte finish. Brushed: (Antiqued) Wire brushes are used to give the stone an aged look. Tumbled: Travertine tiles are put in a tumbling machine with coarse material which will wear out the stone and give it an aged look. Chiseled Edging: A rustic, unrefined finish that creates a timeless atmosphere even in modern construction. limestone are sedimentary stones created over millions of years as organic matter built up and hardened. Travertine is formed when hot springs percolate through limestone formations, leaving small bubble-like formations in the rock. Pure limestones are white or almost white. Because of impurities, such as clay, sand, organic remains, iron oxide and other materials, many limestones exhibit different colors, especially on weathered surfaces. Limestone may be crystalline, clastic, granular, or massive, depending on the method of formation. Available finishes: Polished ­ An elegant, high shine for a more stately and formal appearance. Honed ­ An understated matte finish that softens the stone’s appearance, creating a casual atmosphere in any room. Tumbled ­ A finish that offers you antiqued, ageless style in neutral colors. Chiseled Edging ­ A rustic, unrefined finish that creates a timeless atmosphere even in modern construction.